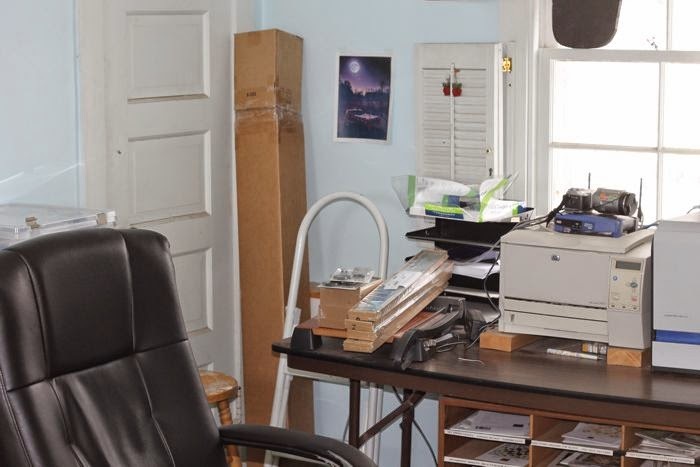 To say that the office was a disaster would be an epic understatement. This picture shows the cleanest part. I am too embarrassed to show you the rest of it. The room was crammed with stuff. Parts of books and patterns, printing stuff, binding stuff, paperwork and general junk was piled higher and deeper and filled every corner. And it was all stuff we thought we needed. 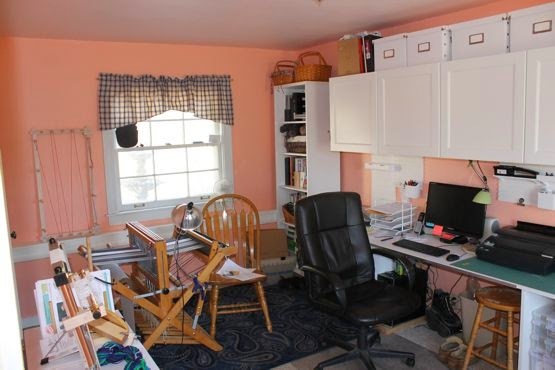 The room was so bad that, even though I relish a challenging organization job, I turned a blind eye to this room. And then there was IKEA. I love IKEA, and luckily the nearest one is about two hours away or I'd be in big trouble. Fine furniture it's not, but its a big cut above chain store stuff and that's good enough for my purposes. This wall is the office. 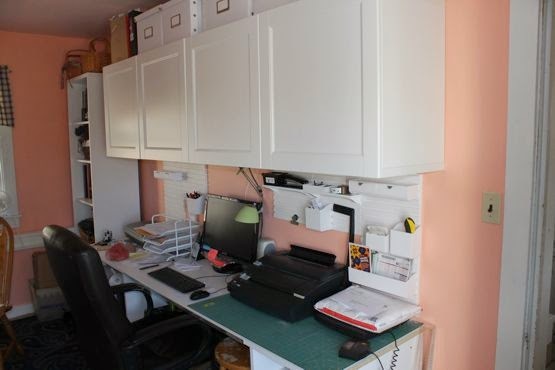 What used to take up the entire room is now mostly hidden behind doors. The desk that filled a quarter of the room (and harbored stacks of homeless paperwork) is gone. A center for tapestry weaving is replacing it. 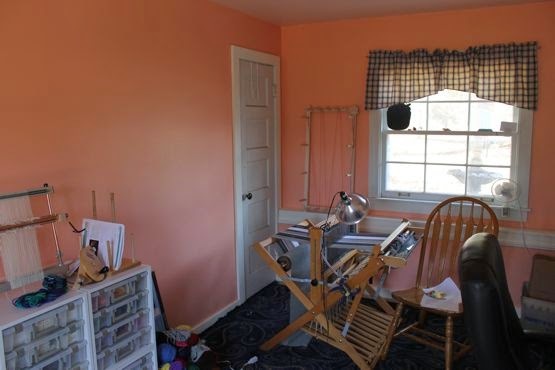 Instead of the jumbled mess from the first picture, a Baby Wolf floor loom awaits. I was worried that I'd gone a little bold with with paint color, but now I love it. The room positively glows! I can't tell you how many times I've gone back to the room because I thought I left the light on. The room is still a work in progress. I'll be sewing up new curtains, there's a new top coming for the tapestry center with room for the bobbin winder. And before much weaving can go on, I'll need a proper bench. My buddies always said that one day my stash would cause me to expand into another room, but I don't think this is exactly what they had in mind. Now with even more applique! As I mentioned earlier, I decided to make templates for the stems instead of using bias strips. It seemed like the best way for a couple of reasons. 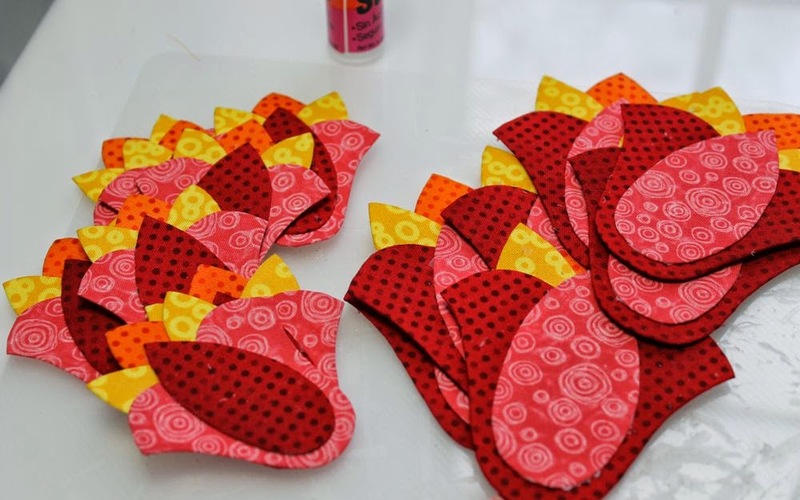 First, I wanted the motifs to be very uniform in shape, cutting templates would eliminate the wobble that sometimes finds its way into bias strip stems. Secondly, this stems are really rather thick, getting them to lie flat might have been a challenge. And last, working with a very dark background meant that even the brightest light box would have a tough time showing the guide lines. These motifs span the background from the pieced block to a background border, so I'd have to squirrel around the entire quilt to do the marking, placement and sewing of the motifs. Ick. 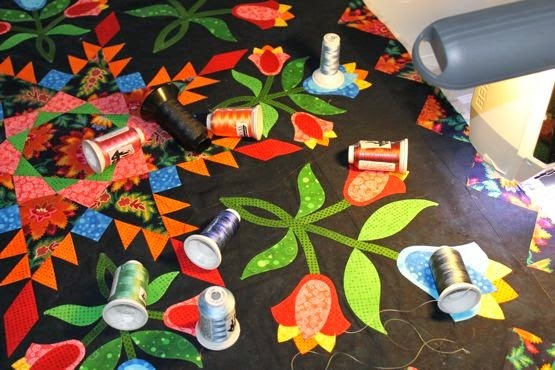 To make life even easier, the entire motifs were sewn together before placing them on the background. 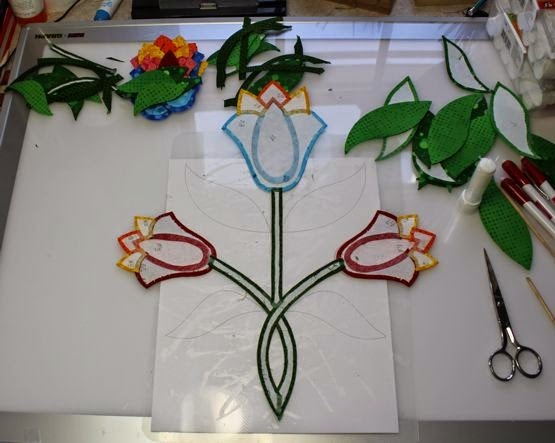 They can be held in place with fewer pins, and since the flower parts and stems are already stitched, all that is left to do is stitch around the perimeter. This close up shows the stitching on the appliques. I'm a big fan of Superior's MonoPoly. It really is the best there is, super fine, flexible and yet strong. Love it. I've used clear here, the smoke color would have been too dark. I didn't quite know how I was going to quilt it, I rarely do. I thought that the quilt was already busy enough, decided that the eye needed quiet places to rest. In the end I quilted the snot out of the background and added just enough stitch in the ditch on the appliques to give some dimension. Most of these spools of thread returned to the bin unused. Here it is, all basted up and ready to quilt. This is the moment of terror, when I take this quilt top that I really love and chance ruining it with my quilting. Yeah, even though I've been machine quilting for more than thirty years, I still have to talk myself down before I attack the quilting. Of course I didn't take a picture of the finished quilt, I was working on a deadline and wanted it out the door. But I wanted to show you a little bit more of the piecing. It's not perfect, although I am very happy with the overall outcome. What I wanted to show is how the seams are pressed. Instead of following the old rule of pressing towards the dark, I pressed all the seams away from the background. In doing so, the design fabric is elevated, pushed forward visually, making the background fabric recede. Stitching in the ditch around the piecing will push that background even further back, giving the design a real opportunity to shine. I do hope that someone heading to Paducah for the show would be kind enough to send a picture of my quilt in the collection. It's the only time one of my quilts will hang in a major show. 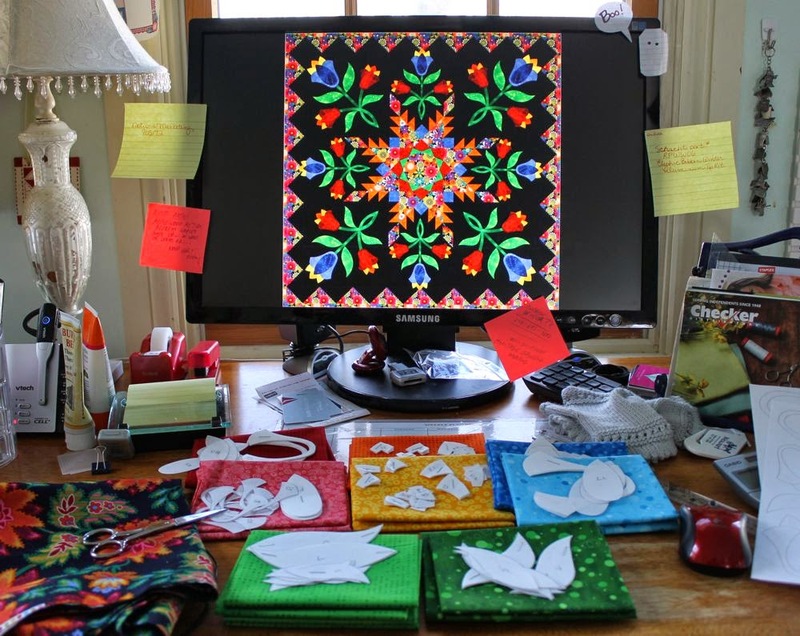 And at next year's show, when the quilt is auctioned off to benefit the National Quilt Museum, I hope it will bring in a tidy sum. When my BFF remarked on how complex the center star looked, I just said, pshaw! It's not nearly as hard as it looks. After all, the feathers are merely half-square triangles! No biggie. Sure, the half-square triangles were a snap, but after that, each step took a lot of consideration. I tried to plan out the order of the steps in advance, but gave up and decided to just hope the star would tell me what to do next. It did, but, I have to say, I haven't sewn this many inset seams in one block before. The block was designed to finish at 23", because it made the math a little easier. I was totally surprised and impressed with myself when it came out to just the right size! With a block with so much fiddling about, I was sure that it would be off by a country mile. 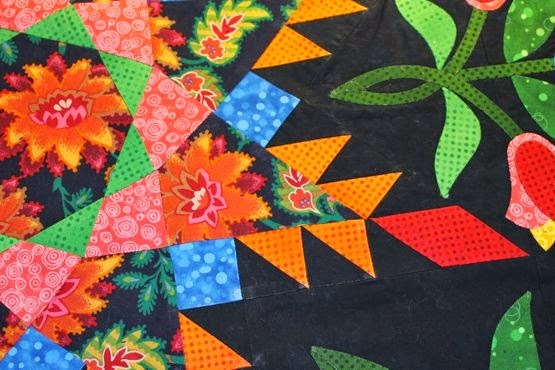 But here's the secret: aside from the ability to figure out piecing order, which did take a bit of advanced piecing know-how, the sewing part only requires the most basic of quilt making skills. 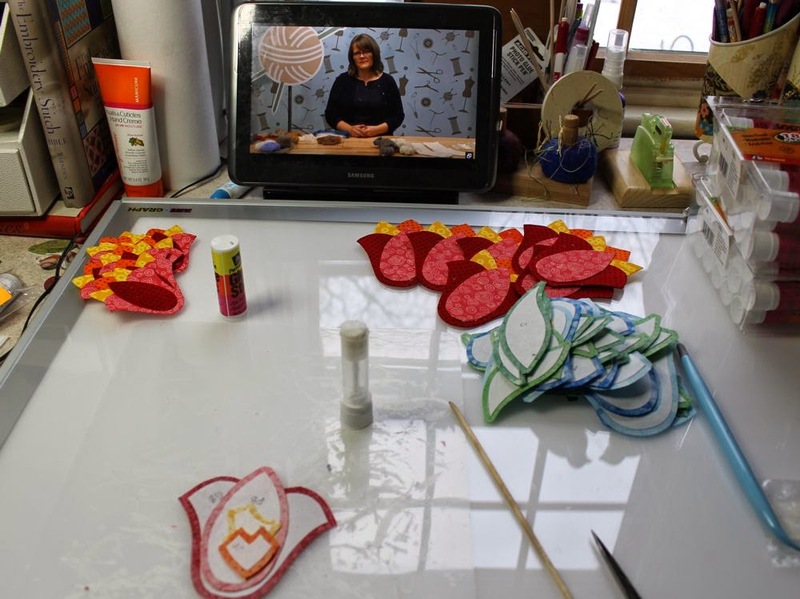 It makes me sound so curmudgeonly to say it, so totally old school, but mastering accurate cutting and sewing will never let you down. 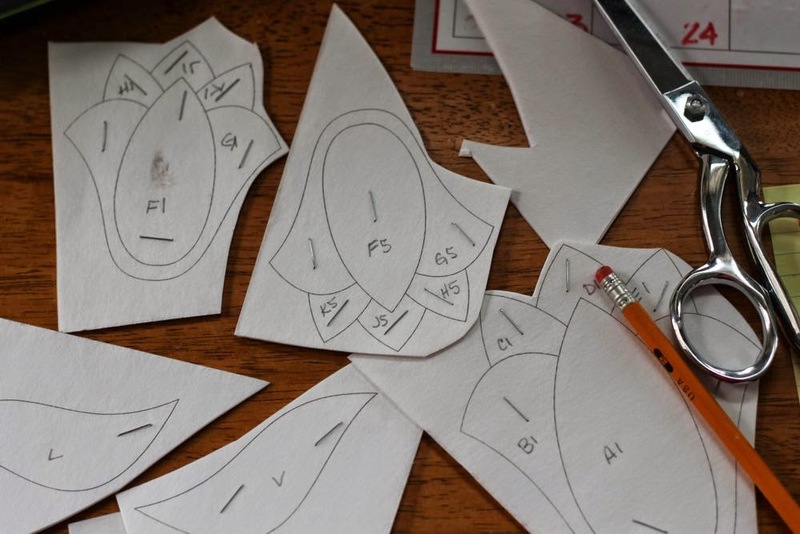 Learning just two skills, understanding how to cut out right sized pieces, and that holy grail of piecing, the quarter inch seam allowance, will open the world of piecing to you. One more skill was needed for this block: understanding inset seams. They are made to sound so scary, but the secret of success is just to always sew away from a fixed seam. In other words, we begin a new seam right where we left off. I've loved the challenge of this quilt, and I'm seriously considering making it again. I'm sort of into pastels at the moment, so maybe I'll make a very girly version to replace the one that got away. Applique isn't hard, it just takes time. It's methodical, and I think that's what I like best about it. Or maybe choosing the colors. Either way, it's a step by step process. 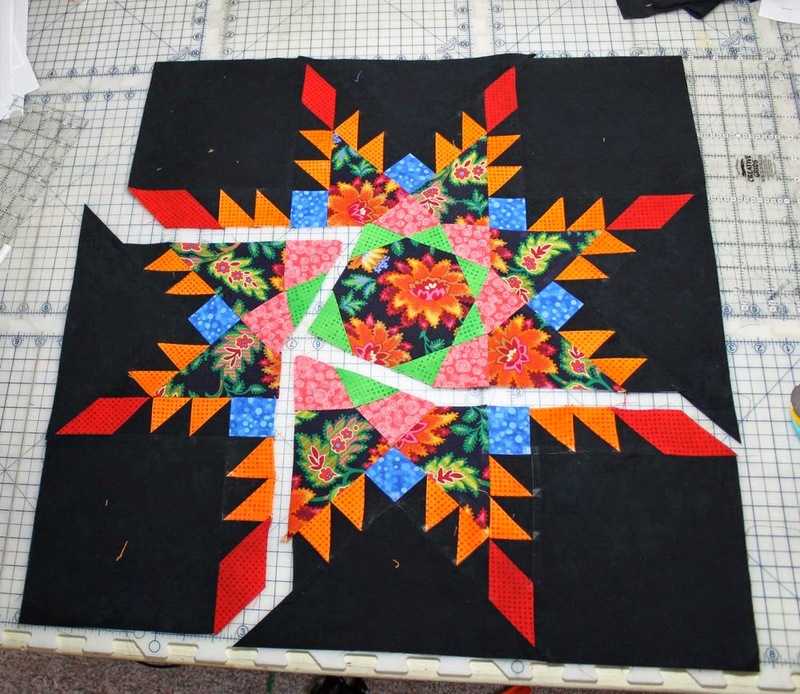 I like to set things up so that I can see my progress, for this quilt I decided to do all the red flowers first, because there are more of them, and when they're done I'm more than half way done with the flowers. That, and a good Craftsy video on my tablet. I'm learning all about different yarns and the projects they are best suited for. In no time at all, I have a beautiful pile of red flowers. Ta Da! And I've learned a few things about yarn. I must have a touch of OCD (or CDO, as I prefer to have the letters in alphabetical order), because I used this project as an opportunity to finish off all my partially used glue sticks. Keeps things tidy, you know? When all of the glue basting is done the shapes are organized into motifs. At this point, I decided to use templates instead of bias strips to make the stems. I want the curves to be uniform, so glue basting seems to be the best course. 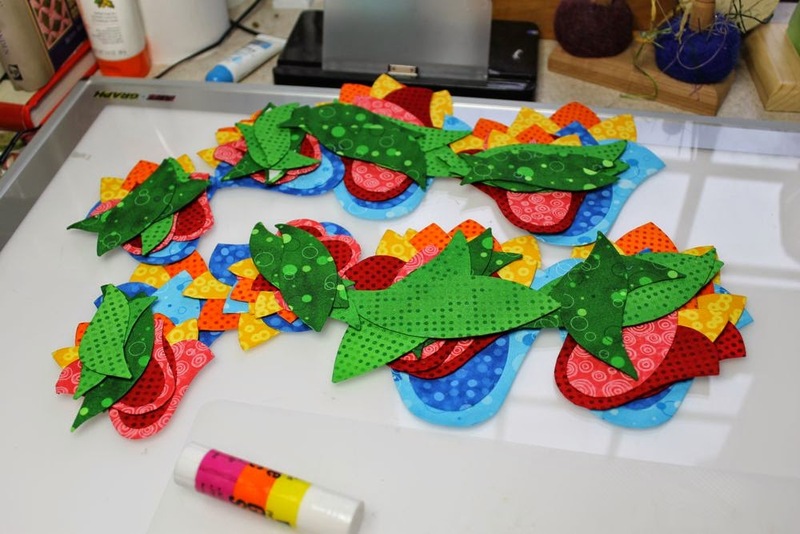 I'm off to make the stems, and when I'm done with the glue basting it will be time to stitch the motifs together. Lots of little things have happened in the last couple of weeks. Nothing exciting really, just day to day sort of stuff. Anyone who's read this blog for any length of time knows that I struggle with the idea that what I do might be interesting to anyone else. But, there are lots of blogs out there that I love to read, so, here goes. The deadline for the Pilgrim/Roy Invitational Challenge is fast approaching. My goal is to ship it out by Friday, but we'll see how it goes. It's been my main focus for the last few weeks. 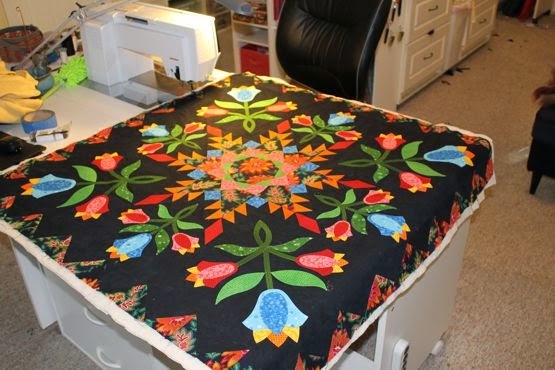 Quilters often think, when they see an applique intense quilt such as this, that it's hard to do. While the piecing gave me bits of fits (can you say inset seams? 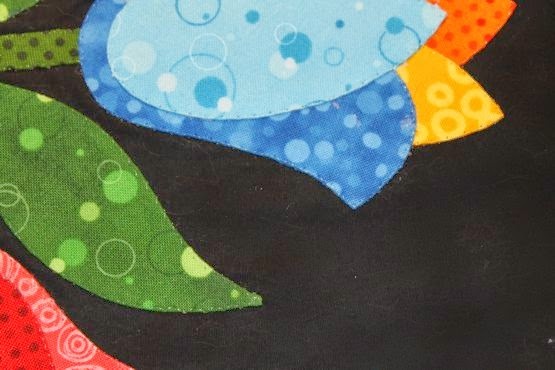 ), the applique is just simple shapes. The motifs are not difficult to do, but they do take time. I struggled a bit, with the fabric choices. As you've seen, I really wanted to use polka dots, the challenge fabric just begged for polka dots! But I was seriously dubious about my original selections, and had pretty much given up on the idea. I had a brief retail therapy opportunity before speaking for the Gathering in Fort Wayne, IN on National Quilt Day, where I found this perfect palette of dots. 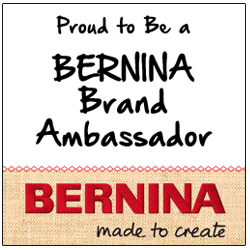 All tone on tone, multiple values, perfect compliments to the crazy challenge fabric. (Yes, those are fingerless gloves on my desk, it can get pretty nippy in the studio.) 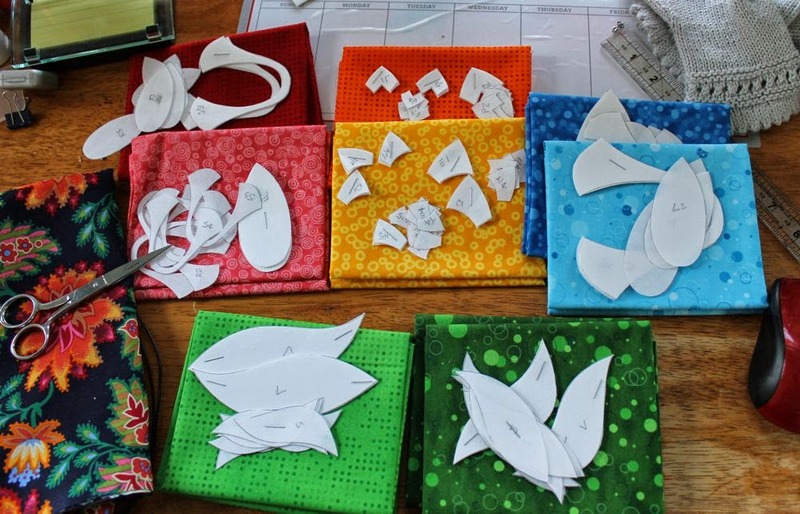 Once I had just the right fabrics, I just dove into creating the templates for the applique shapes. It's been a while since I've worked on a project with repeating motifs, but by marking each piece (I call it my addressing system), I'll know where each shape belongs. 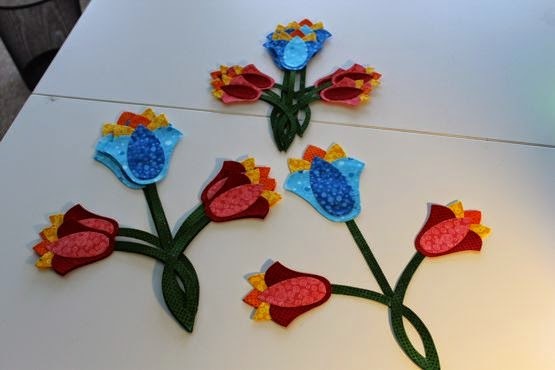 As the flowers were cut apart, each shape was stacked up on the appropriate fabric and then pressed in place. Another big bite of the project is done.